I am the Chairman of IISA GB Board and an IISA Official. Together with the other GB board Members I have responsibility for organizing the GB Ice Swimming Championships. I am grateful to have the opportunity to help shape the future of our unique and wonderful sport, and to promote it safely. I love to swim wherever I can – in the sea, rivers, lakes and swimming pool (Masters), in the UK and abroad. I enjoy open water swimming all year round. 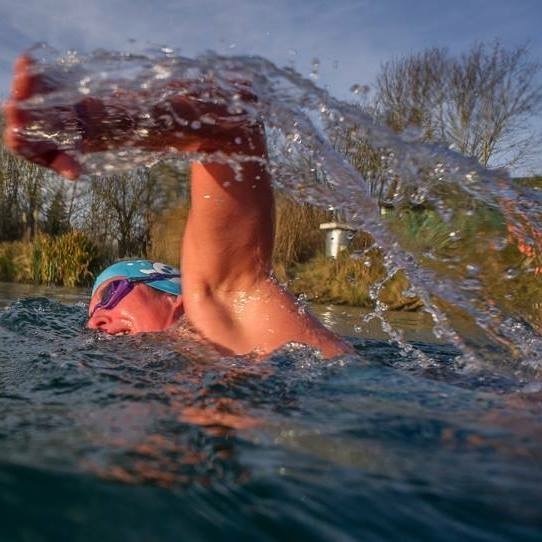 The buzz I get from ice swimming is amazing, and in the summer I really enjoy long distance / endurance swimming together with a variety of competitions and events. The camaraderie and friendship amongst the open water and ice swimming community is second to none. My first cold water competition in cold water was at Tooting Bec Lido for the UKCWSC in 2013 where I won a bronze medal. However it wasnt until 2014, after the Jinan Festival of Springs Competition in China that I got a real taste of serious ice swimming. I travelled up to Harbin in the far NE of China and had several dips with the local ice swimming club. The air was -33 C …. it took an hour at dawn to clear the river pool from thick ice that formed each day, but the swimming was amazing. In January 2015 I did my first official Ice Mile and then in March I was selected to represent the UK in the First World Ice Swimming Championships 1km in Murmansk, Russia. This was a serious challenge but one that I was very excited about and I trained extremely hard for. I had been swimming in local lakes and rivers 4-5 times a week. I had spent a week in Snowdonia hiking to the coldest lakes I could find to swim twice daily. Then, shortly before travelling to Russia I was given an old bath and resorted to having ice baths in my back garden !! The atmosphere and venue in Murmansk was spectacular -we were all treated like Olympians. The water was marginally above freezing and the air sub zero. I swam late in the day, after the solar eclipse. Soon after I started swimming the sun went behind the clouds and it snowed heavily. I was thrilled to finish the event and ecstatic to learn later that I had won a gold in my age group and set a new world record for my age group. I am lucky enough to have travelled, and taken part in ice swims in many wonderful places. One particularly memorable trip was in March 2017 when I was lucky enough to be part of a swimming expedition to Arctic Norway. The fjord scenery was stunning, the sea crystal clear and icy cold. I successfully completed my Polar Ice Mile here. Some of my other swimming achievements include a Cross Channel Solo 2016 (32km), Lake Zurich Solo 2014 (26,4km) a 4 person relay around the Isle of Wight 2014 (58 miles) as well as a large number of shorter swims and competitions in the UK and abroad. I am always pleased to be able to give something back to the swimming community and to inspire others. I have supported several swimmers doing cross channel solos and taken on the role of WOWSA observer for world record Iron Swim attempts in Tunisia. I have established a cold water swim club, Swanwick Seals, at Andark Dive Lake, Lower Swanwick, Hampshire, and have successfully secured grant funding for a club sauna. Please find us on facebook if you would like to join – everyone welcome. Finally, I would like to thank all my friends and family who have supported me over the years and helped me succeed in my swims.